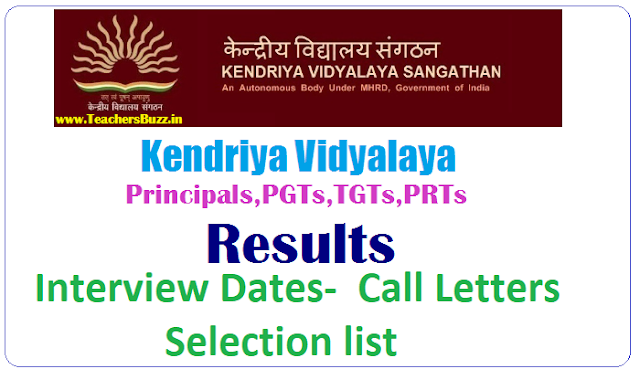 KVS Principals, PGTs, TGTs, PRTs Recruitment Results @Kendriya Vidyalayas/ KVS teaching,Non teaching Posts Recruitment results @Kendriya Vidyalayas: Each state Kendriya Vidyalaya Sangathans have issued the teaching, non teaching posts 2019 recruitment notification and each state, KVS invited the online applications from the Indian Citizens for recruitment on teaching posts(Primary Teachers (PRT), Trained Graduate Teachers, Post Graduate Teachers for the year 2018-19. The subject wise Kendriya Vidyalaya Exam Merit List for the posts of Trained Graduate Teachers, Post Graduate Teachers, Primary Teachers and Principal to be prepared by the officials separately. The authority will place the names of selected candidates in the KVS Post/Trained Graduate Teacher Result PDF. 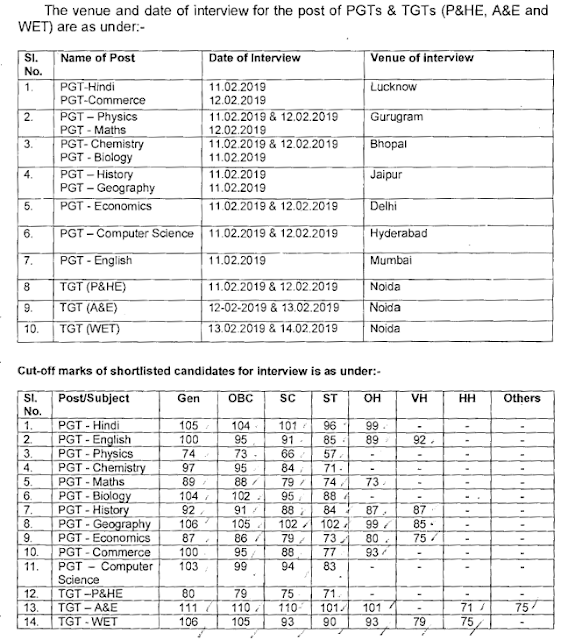 The list of qualified candidates called for interviews details, KVS Interview Call Letter link to download it directly from the concerned site. The Kendriya Vidyalaya Sangathan (KVS) has released the list of the candidates who are shortlisted for the interview for the post of PRT PGT and PRT, on KVS official website- kvsangathan.nic.in. The TGT list of Interview is for the subject teachers of - Hindi, English, Sanskrit, Science, Maths and Social Studies. Candidates are informed that the Interview for the PRT’s is to be conducted from February 25-27, 2019. While the Interview for the TGT will begin from February 14, 2019 and conclude on February 21, 2019. KVS has already released the list of shortlisted candidates for the PGT's and TGT's (Misc.Category) on January 24, 2019. Click on the link given here to check the list of candidates selected for interview process as part of direct recruitment in KVS based on their KVS PGT TGT and PRT written exam results. KVS PGT TGT Result: List of candidates shortlisted for interview for the post of PGTs and TGTs (Misc. Category) in KVS. The KVS is conducting the recruitment exams for the post of PGT, TGT, PRT, Librarian. The exams were held from December 22 to 23, 2018, across the country. The exam was conducted in three sessions - morning, afternoon and evening. KVS has released the written exam results for the Librarian posts. The KVS Librarian result and list of candidates selected for interview round is now available on the official website of the Kendriya Vidyalaya Sangathan. The candidates who appeared for the KVS Librarian written exam now need to appear for interview session also which will be of 60 minutes. "The weblink for downloading the interview letter will be available on KVS website . Request for change of interview venue will not be entertained," said KVS TGT results notification. Download the letter of interview for the post of PGTs and TGTs (Misc. Category) in KVS on the website of KVS. Download the Proforma of Bio-Data, NOC/Vigilance/Service Certificate/OBC Certificate. How to check KVS PRT PGT TGT Exam Results 2019:1. Open the official website or click on a direct link uploaded below. 3. Click on a DOWNLOAD option. 4. A Merit list containing names of selected candidates will open on your screen. 5. Find out your Name/Roll Number and then download the pdf file of merit list/scorecard to your device. 6. Save it to the desktop after downloading. 7. Make one print of your mark sheet for use during the next selection round. 8. Safely put this result copy as it will be needed further.